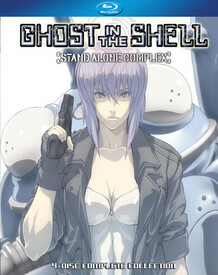 Ghost in the Shell: Stand Alone Complex contains episodes 1-26. Major Motoko Kusanagi is a beautiful but deadly cyborg that is squad leader of Section 9-the Japanese government's clandestine unit assigned to battle terrorism and cyber warfare. Surrounded by an expertly trained team, Motoko faces her ultimate challenge- the Laughing Man- a terrorist who orchestrated a kidnapping and extortion plot many years ago and has suddenly reappeared. In order to discover the identity of this enigmatic criminal, Motoko and Section 9 are drawn into a deadly labyrinth and they’ll have to use all their expertise to survive. This acclaimed anime series is from Production I.G (Kill Bill) and features the amazing music if Yoko Kanno (Cowboy Behop) with stories by Kenji Kamiyama (Blood, Jin-Roh) and Dai Soto (Eureka SeveN).